When was the last time you had the pleasure of standing in a truly expansive and breathtaking place? Where the horizon stretches out for miles and every inch of your vision is saturated in beauty? Now try to describe that view. It’s pretty hard isn’t it? There aren’t enough of the right words to convey the sights and feelings in that moment, and most of the time, snapshots aren’t going to do it justice either. Most cameras can only capture one quarter of what our eyes can, and here is where a panorama comes in! There are a few techniques you can use while shooting to set yourself up for success later on. Now I know for some of you, it may be too late for these tips, but fear not! We will work with what you have. But if you haven’t shot yet, pay attention to these few ideas. First off, choose a point of view and stay there. It’s important that the camera stays stationary while taking photos for a panorama. Secondly, pan across the view steadily, finding visual cues to help guide your way. For example, that large rock in front of you can serve as the boundary between shots 2 and 3. Thirdly, leave a little overlap between each shot- it’s easier to erase redundant content than create something from nothing. 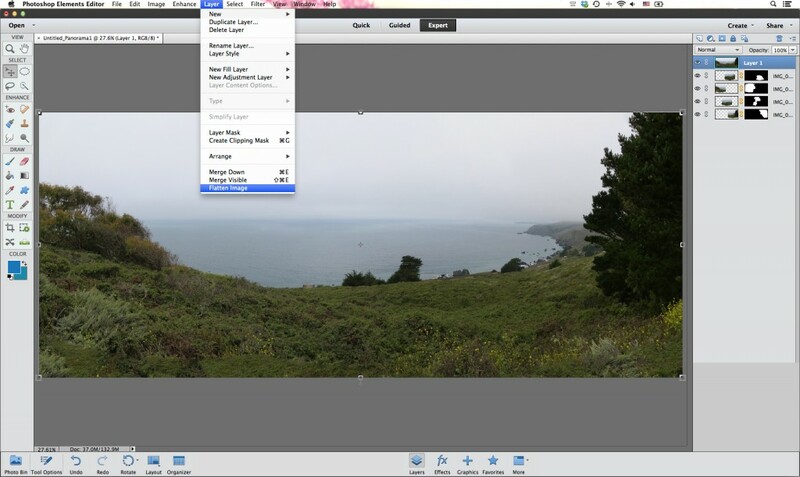 Give yourself more images to work with in the end (within reason) and you will produce a better panorama! 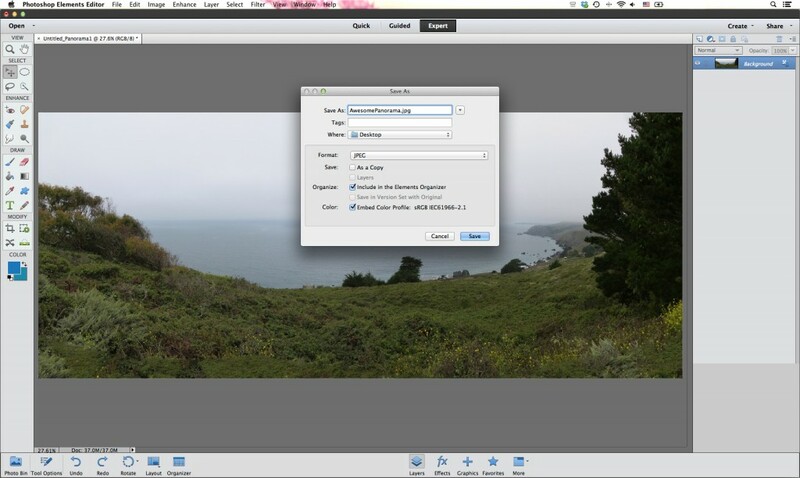 Open up your preferred Adobe Photoshop program (this tutorial uses Elements 12) and choose the Photomerge Panorama option. 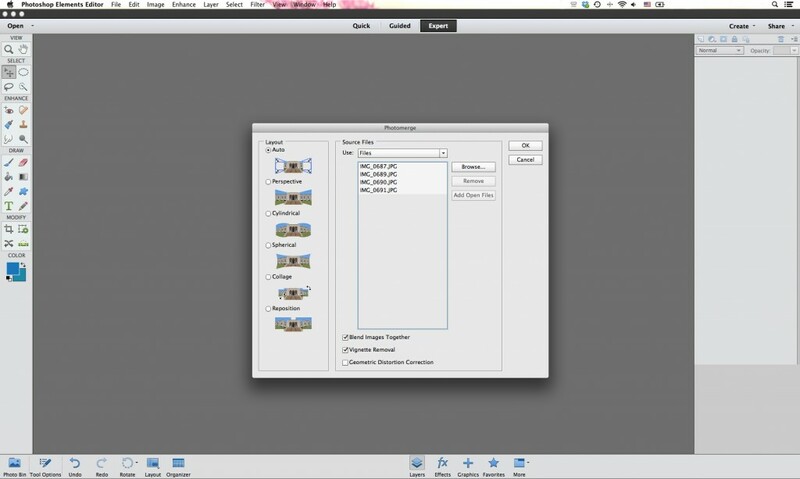 This is a handy and highly intelligent tool that will patch separate images together to make one nice cohesive image. Up at the toolbar, go to Enhance > Photomerge > Panorama. Here’s the hard part. Now, hopefully you’ve already gone through your photos and chosen the best set based on the tips mentioned in step 1. You should have between 3-6 separate shots to work with. 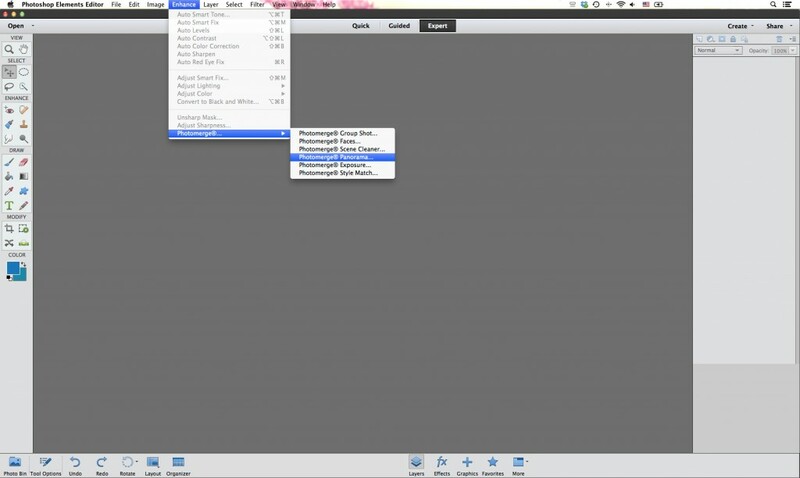 In your window, for the purpose of this tutorial, choose the Auto layout option. Upload your desired images and make sure that the Blend Images Together option is checked (it usually automatically is) along with Vignette Removal. The former tells Photoshop to not only merge the images, but to blend colors and tonalities as well, and the latter makes sure that the natural darkness in the corners of the images is lightened. This way you don’t end up with alternating light and dark patterns across the expanse of the final panorama. There is a third option, Geometric Distortion Correction, that is helpful if you shot using a very wide-angle or fish-eye lens, as these lenses create a warping effect around the edges of the frame. I was using a normal lens, so this option is not checked. After you click OK on the Photomerge program, it will work its magic for you. 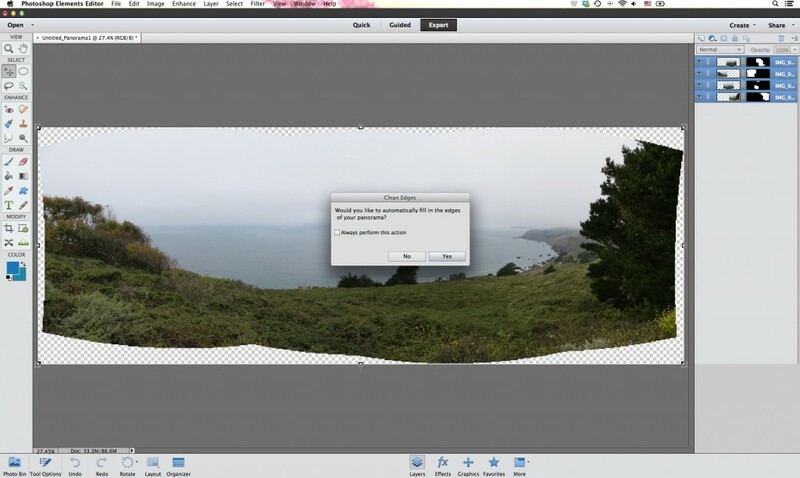 It will patch together your photos using advanced color and pattern recognition software, but there will always be empty space around the edges after it has completed this step. Another window will pop up and ask if you want the program to automatically fill in the edges of your panorama. Click Yes. Now your panorama should be looking pretty good. The edges should be filled in and you should be left with a complete rectangular photograph with no visible missing spots or distortion. If it doesn’t look quite right to you, go back to step 3 and try again using a different layout option: Perspective, Cylindrical, and Spherical are your best bets. Sometimes it takes a few goes before you find the layout that works best for your photos! But if you’re happy with it, it’s time to compress your individual layers into one flat image. Go to Layer > Flatten Image. Now that your panorama is complete, you can feel free to tweak the saturation, contrast, and make other visual adjustments. Just be sure to save your work when you’re done! Easy as pie! Enjoy your beautiful panorama as a desktop background, mantelpiece art, or a binding wrap for a photo album!